From the sear to the sizzle to that first sensational, smoky mouthful, everyone loves food hot off the grill. So why not take grilling to the max and cook the entire meal over the coals? The secrets to doing just that are right here in Michael McLaughlin's "All on the Grill. It's packed with easy, inventive recipes that are either completely cooked over fire or conveniently prepared ahead and finished on the grill at the last minute, with no running back and forth to the kitchen. In addition, you'll find all the techniques, tips, and tidbits you need to keep from getting raked over the coals when you fire up your backyard barbecue. Creating a whole menu on the grill with the aplomb of a professional can be a dinner-party triumph, not to mention a whole lot of fun. Master chef, cooking teacher, cookbook author, and grillmeister extraordinaire Michael McLaughlin shows you exactly how easy it is to make it all work. 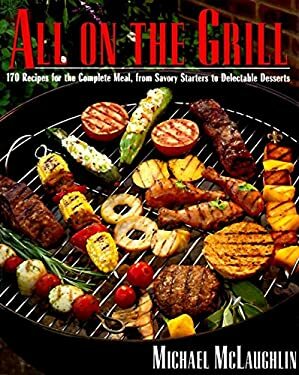 Most important, of course, is the food, and in these pages McLaughlin shares 170 of his simplest, tastiest grilling recipes. You'll find irresistible appetizers, main dishes, side dishes, and even grilled desserts -- all with the sophisticated but gutsy taste and foolproof directions he's known for. To make all this as easy as adding a few coals to the fire, McLaughlin includes full menus, each with its own game plan, plus some add-ons, beverages, and desserts that you can buy or assemble simply to fill in. Wherever possible, recipes are designed to let you know what steps can be done ahead. In grilling, technique is everything, and all the information necessary to guarantee success is included. No matter what kind of grill you ownwhether a terrace-size charcoalhibachi or a monster grill powered by natural gas -- McLaughlin leads you step-by-step through all kinds of grilling. He takes the mystery out of using wood for added flavor and includes dozens of tasteenhancing marinades, sauces, and rubs. He details the advantages and disadvantages of different fuels: charcoal briquettes, natural wood charcoal, firewood, and propane. And he has words of wisdom about the best way to start a fire and the best way not to. All in all, "All on the Grill is all you need for great outdoor cooking. Used Like New (1 available) 0060173831 Oversized 221pp including index 170 step-by-step, easy-to-follow recipes for the complete meal, from savory starters to delectable desserts. FIRST CHOICE BOOKS, INC.